Lock in a great price for Hotel Nordic – rated 8.8 by recent guests! Great breakfast, one of the best I have ever had! Dinner was good, nothing fabulous! Location is good when enough snow for ski in and ski out but we had no snow near hotel....rest was fine. Liked pool, sauna, jacuzzi, gaming area, and food was good. Warm, comfortable, clean, well organised. Nice rooms with balconies, comfy beds, baths in the bathroom and drying rack/line. Spotlessly clean with daily maid service. We were there on Valentine’s Day and they left a half bottle of cava and some chocolates in the rooms - so thoughtful and a typically nice touch. Small pool with jacuzzi and steam room. Perfect post-ski. Food was buffet style - copious and good choice/range on offer. Ski straight to lift from hotel & straight back to hotel lockers afterwards. Staff were helpful and very courteous. it is just a normal hotel. something like a sheraton or a marriot. Rooms are good size and clean. Nothing really worth mentioning. Three of us were originally in an apartment which is quite far away from the main hotel blocks and too far from the rest of our family. The hotel staff were very kind and polite as they moved us into a hotel room. I would warn the apartments although big and clean are very noisy, with paper thin walls. That said, if your family all fitted in the one apartment, it would probably be a cost effective solution. But not for us! That aside, once moved into the hotel area, it was all exactly as you could hope. Ski in, chairlift straight out. Polite, friendly staff. Large comfortable sitting areas. Buffet breakfast and dinner full of choice. Not as super-fresh as we have had on coastal holidays, but this is up a mountain after all. Very good choice and alway a large selection of salads and cold meats if the meats don't appeal. We'll be back! Location and scenery. Ideal for skiing. Very comfortable hotel. Excellent choice and quality of food. For skiing, it is the perfect location. Just in front of the lift up to the main slopes. No queues. Free parking above the hotel, literaly a 30 seconds walk. Hotel facilities are excellent and staff really helpful. The restaurant, as it is self service, is geared to large crowds. If you are looking for fine dining in a relaxed atmosphere, you might have to go elsewhere. Large selection of options for food for breakfast and dinner. Hotel Nordic This rating is a reflection of how the property compares to the industry standard when it comes to price, facilities and services available. It's based on a self-evaluation by the property. Use this rating to help choose your stay! One of our top picks in El Tarter.Perfect for a winter or summer break in the Andorran Pyrenees, this set of charming mountain chalets lies right at the foot of the Soldeu-El Tarter slopes. Guests have free access to the indoor and outdoor pools and the hot tub. Find more relaxation within the hotel – in your own comfortable bedroom or in the extensive spa center, where you can use the sauna for an extra cost. When would you like to stay at Hotel Nordic? This stylishly decorated room features a balcony with views over Tarter. It includes 2 single beds and 1 extra bed and has a flat-screen TV, safe and private bathroom with hairdryer. Has views of the ski slopes. This stylish apartment features scenic views over El Tarter town or over the garden. It features 1 bedroom with 2 single beds and a lounge with 2 sofa beds, telephone, flat-screen TV and safe. There is a small kitchenette with fridge and microwave, and half-board is included at the hotel's restaurant. Free WiFi is available at the reception of the hotel. WiFi in the apartment has a surcharge. House Rules Hotel Nordic takes special requests – add in the next step! Hotel Nordic accepts these cards and reserves the right to temporarily hold an amount prior to arrival. Please note that the outdoor pool is only open from 01 July to 31 August. Please note that the published rates for the half board for stays on the 31 December include a mandatory fee for the gala dinner held on that evening. Breakfast buffet coffee terrible. Come on guys, Nespresso or similar would be much better than these machines. Pool on the small side. WiFi only available in reception and bar areas. Wifi was poor but perhaps this is a problem across Andorra. Would have liked robes in the room so you could go to and from the indoor pool without having to change. Tea and coffee in the room would have been nice. 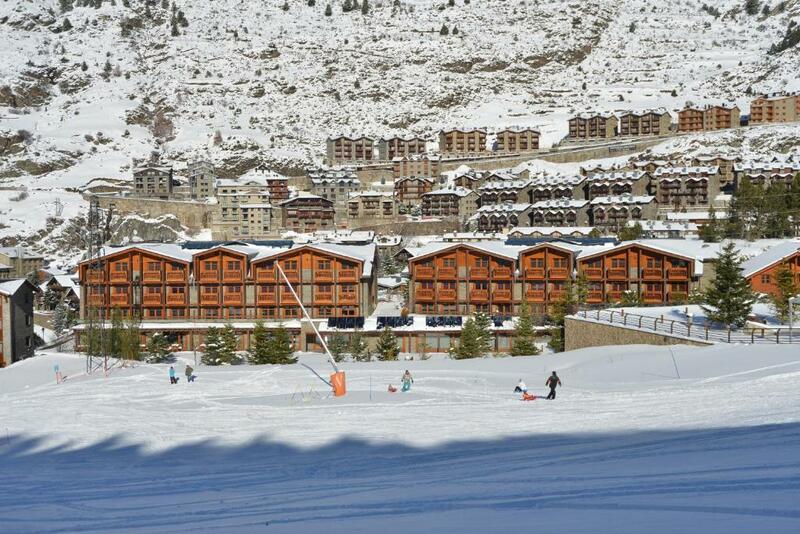 Convenience of the location right next to the chairlift, ski lockers and a bar. Food and facilities very good. Very good for familes and groups of friends. The corridors where the lockers for the skis are. Too narrow for people to change into their boots comfortably. At peak times, it felt like an obstacle course trying to get changed and out. Super close to the slopes and so very comfortable for those wishing to ski. Relaxed environment and very helpful staff. staff wouldn't let us enter swimming pool without paying for hats first they treated us like criminals even though we were paying 450 a night to stay there. they made us go back up to rooms for cash in swimmers etc with kids. Pool was almoast cold! should be hot! Not even the jaccuzi was hot. Wifi was going on and off. Outdated 90’s decor. No services matched to four star rating (in-Room Wi-Fi, complimentary water/coffee, only plastic cups, safety box extra charge etc). Dinner was absolutely horrific, microwave dinner quality.